Arlington Memorial Park Cemetery is located on the southeast side of Rockford, Illinois. It is a division of our pet cemetery, Arlington Pet Cemetery. A peaceful 70-acre cemetery, it presents an opportunity to visit a loved one's final resting place in beautiful, park-like surroundings. Arlington offers beautiful burial grounds in Rockford, IL, and helpful burial services needed when laying a loved-one to rest. Arlington's well-kept gardens, extensive lawns and burial lots create an ambiance of peace and tranquility. To see the gracious beauty of this cemetery is to feel that here is the best place for your loved ones to be laid in their eternal resting place. We encourage families to discover all the advantages you gain by making an early selection of your family burial lot. Traditional interment and cremation burials are both available. We offer single, companion, estate, or family lots. For additional questions about our pet burial lots or cremation services, visit our FAQs page. The year was 1927. 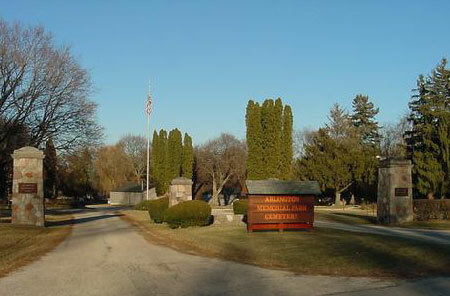 Here in Rockford, Illinois, a group of prominent citizens founded what was known as Arlington Memorial Park Cemetery. The far-East Side location, now 6202 Charles St., was well out of town and located on a 78-acre farm. Those founding fathers decided that 30 acres of restful and rolling meadows were to be developed into lots, winding roads, and wooded burial sites. It was decreed from the beginning, that this new and wonderful Arlington Memorial Park Cemetery was intended to be a final place of interment not only for the notable and/or prestigious inhabitants of Rockford and the surrounding areas, but for all persons - no matter what their social, economic, or ethnic status. Among many of the first persons to buy lots and promote the Arlington Cemetery were community factory workers, the backbone of early Rockford's industrial contributors. By 1987, 6,000 persons had already placed their loved ones to rest in those Elysian fields. Families were larger in those days, and typical family lots contained between 12-24 individual burial spaces. Even so, there were still another 7,000 spaces available from the original 40 developed acres, with an additional 16 acres available for expansion. Arlington currently features an infant burial ground, a Muslim burial section, a cremation area, and a pet burial site. The cemetery is governed by a voluntary board of directors consisting of seven members. This group of advisors makes all decisions regarding financing and operations.